Clare Wilkinson, described as ‘flawless … heartfelt … heavenly’ (Early Music America), ‘heart-stopping’ (The Guardian) and ‘one of the best young singers in the Renaissance game’ (The Independent), spends her time making music with groups of different shapes and sizes – Baroque orchestra, consort of viols, vocal consort – and loves them all. 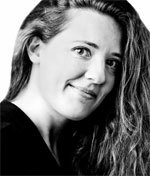 She has been alto soloist in all the major works of Bach with Sir John Eliot Gardiner, and recorded Bach and Monteverdi with Andrew Parrott; other collaborations have been with Jos van Veldhoven (Netherlands Bach Society), Richard Egarr (AAM), Adam Fischer (SCO) and Bart Van Reyn (Le Concert d’Anvers). Stage work includes Venere in Monteverdi's Ballo dell’Ingrate (Proms) and Galatea in Handel's Aci, Galatea e Polifemo (London Handel Festival). Equally at home with viols, Clare sings with The Rose Consort of Viols and Fretwork, enjoying a comprehensive survey of the repertoire, from Byrd to Tan Dun. Numerous composers have written for Clare. She premièred works by John Joubert, Duncan Druce and Stephen Wilkinson at Wigmore Hall, and a new piece for lute and mezzo/lyre by Thomas Smetryns at the Vleeshuys Antwerp.